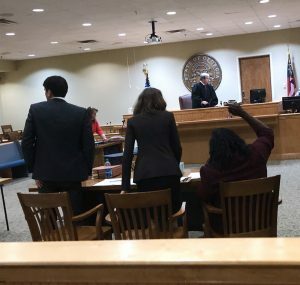 Yesterday, a Wayne County jury returned a not-guilty verdict – after just 20 minutes of deliberation – for Southern Center for Human Rights client Olivia Pearson. Ms. Pearson was initially charged with two felonies: illegally assisting a voter, and falsely signing a form explaining her reason for doing so. SCHR was successful in getting the first charge dismissed. This was Ms. Pearson’s second trial; her first ended in a mistrial after the jury could not reach a unanimous verdict on either count. Ms. Pearson outside the courthouse. Ms. Pearson is an African-American grandmother who has dedicated her life to public service in Douglas, Georgia. 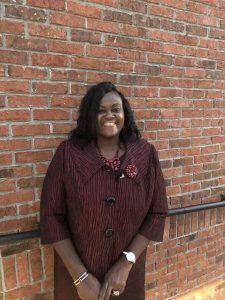 Eighteen years ago, she became the first African-American woman elected to Douglas’s city commission and has run unopposed for her seat in every election since. Her mother helped sue the city of Douglas to gain more African-American political representation in the 1970’s. She was prosecuted for showing a first-time black voter how to use a voting machine during Barack Obama’s re-election in 2012 in Coffee County, Georgia. “I’m glad that the Wayne County jury saw this case for what it was, and rightfully acquitted Ms. Pearson in 20 minutes. We’re thrilled for her,” said SCHR attorney Mark Loudon-Brown. On October 15th, 2012, a young woman named Diewanna Robinson was voting for the first time in Douglas, Georgia. When Ms. Robinson took the stand at trial, she testified that she’d requested assistance in using the voting machine, that Ms. Pearson had agreed to help show her how to use the machine, and that Ms. Pearson neither told her who to vote for, nor influenced her vote in any way. She testified that Ms. Pearson’s instruction ended at how to operate the machine. Nevertheless, Ms. Pearson was charged with two felony offenses. “This was without a doubt a racially motivated targeted prosecution of a woman who was exercising her right to get out the vote in her community,” said Sarah Geraghty, Managing Attorney at SCHR. 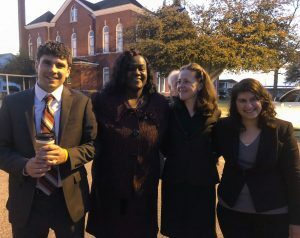 Ms. Pearson and her SCHR legal team await the jury’s verdict. Ms. Pearson reacts to the jury’s verdict – not guilty. “Yesterday was finally the end to a very tumultuous time in my life. 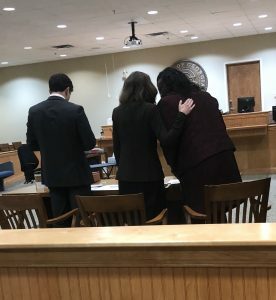 I am so grateful to the jurors of Wayne County for being able to see the truth and allow justice to prevail,” Ms. Pearson said. Ms. Pearson’s legal team was comprised of Mark Loudon-Brown, Sarah Geraghty, and Maya Chaudhuri of SCHR. Ms. Pearson and her SCHR legal team. Great Job SCHR and Wayne County Jurors!!!;! Glory Be To GOD The MOST HIGH! !